Curry sympathized with and encouraged the fellow Black educator but offered no gimmick remedies or hopeful rhetoric. Brandishing a Ph.D. Curry holds full tenure at the University of Texas A&M but says his accomplishments have “afforded me no respect from my white colleagues.” His new book, “The Man-Not: Race, Class, Genre, and the Dilemmas of Black Manhood,” corroborates and dissects the New York teacher’s observations. During the 2014-2015 school year, nonwhite children outnumbered white children for the first time in public school history. But with an unprecedented demand for teachers that reflect the students they’ll be charged to educate, the pipeline to the classroom is blocked for Black male teachers. Dr. Travis Bristol, a former New York City high school teacher and current research and policy fellow at Stanford Center for Opportunity Policy in Education, told Boston, Mass.’s WBUR Radio that, “The experiences of Black males teachers really represent a microcosm of what’s happening to Black teachers in urban United States.” He cited Chicago, New Orleans and Washington, D.C., as cities where Black educators have vanished over the past 15 years. Bristol, who is Black, emphasized that the loss of Black male teachers is especially damaging because of their already-paltry numbers. In the essay “Black male teachers: There aren’t enough of them,” Bristol details the routine violation and despair faced by Black male teachers like Dante Smith. A former high school teacher, Smith observed Black students treated like murderous convicts skilled at concealing contraband. He said an administrator doubted that he’d collected all the students’ cell phones even after Smith showed him the confiscated mobiles. “Believing that he had not collected enough phones, the administrator interrupted the exam to stop and frisk the students for cellphones,” Bristol writes. Smith resigned the next year. This also helps explain why Dante Smith and many other Black educators seek a new line of employment. Having a front-of-the-class view of the criminalization and miseducation of Black boys and girls erodes many Black educators’ love for and reason for teaching. Bristol made similar observations while studying a collection of Black male teachers in Boston during the 2013-2014 school year. A Northern city infamous for violent white opposition to the busing of Black students in the 1970s, Boston is subject to a 1985 court order to have 25 percent of public school teachers be Black. Bristol noted a glaring pattern where Boston’s Black male teachers “were concentrated in the most challenging schools.” Seeing classrooms brimming with Black children attending schools designed to under nourish and fast-track Black boys to prison sabotages the most talented of instructors. While he was visiting WBUR, Bristol had a statement pledging Boston Public Schools’ commitment to Black and nonwhite pupils read to him. “If you look at overall student achievement, the group that is most at risk tends to be Black males. This is the demographic that tends to have the lowest academic growth and lowest overall graduation rate. We can do more to support these students and their families,” BPS officials wrote. Bristol dismissed their remarks as worthless gab, noting that, in Boston, “Over the past four years, the percentage of Black male teachers continues to fall.” Authentic concern for Black students should be reflected in vigorous commitment to hiring, retaining and valuing Black educators. 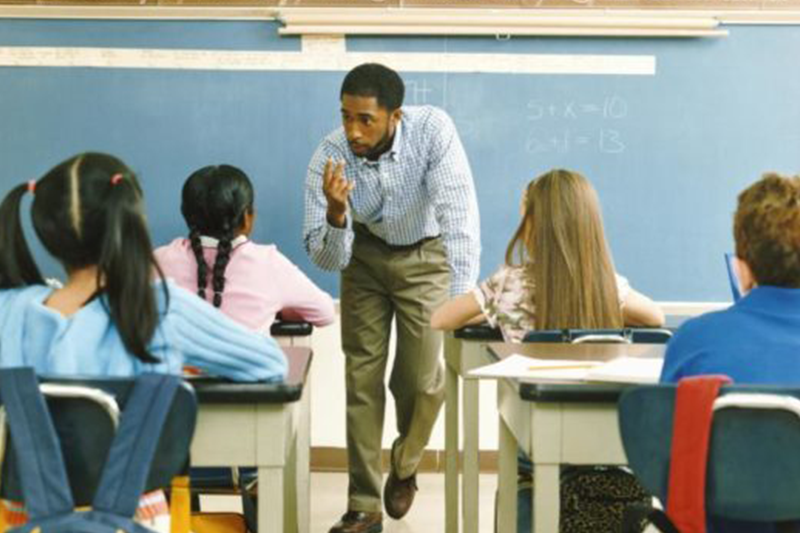 As opposed to feeling welcome, Bristol explained that Boston’s “Black male teachers, specifically, are more likely to have negative evaluations.” Being placed in the most demanding teaching environments and simultaneously subjected to the harshest scrutiny guarantees that Black male teachers will continue to have one the highest turnover rates of any educators. Like prison, the classrooms are designed to be “hard” time for Black students and Black educators. Gus T. Renegade hosts “The Context of White Supremacy” radio program, a platform designed to dissect and counter racism. For nearly a decade, he has interviewed and studied authors, filmmakers and scholars from around the globe.